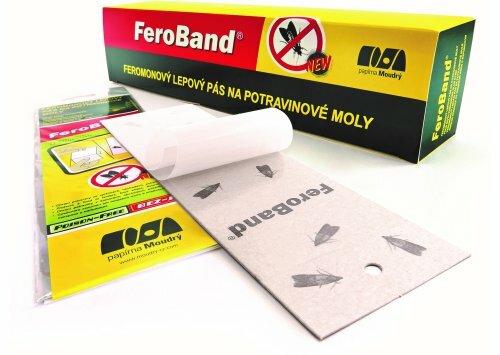 FeroBand – Pheromone adhesive strip for monitoring food moths | Papírna Moudrý, s.r.o. One sided adhesive strip that contains pheromone specifically effective for catching food moths males of genera Ephestia elutella, Ephestia kuehniella, Ephestia cautella and Plodia interpunctella. It is a flat strip with the pheromone for food moths in the glue. The adhesive strip is easy-to-use. It can be hung on the hook or string wherever you like. The strip is small and space-saving. The pheromone strips are able to lure male moths in rooms sized up to 500m3. The efficiency and affectivity of the food moth strips have been proved by both laboratory tests and hands-on experience. As the food moth pheromone strips attract and trap the male moths, the reproduction is stopped and the food is protected from their larvae. When the strip is placed not all adults of the male moths are destroyed at once, but it ensures that there will not be larvae in the food.